Fishing the azure waters of the Sea of Cortez to Land’s End where the Pacific Ocean meets the Sea, is an unbeatable combination. 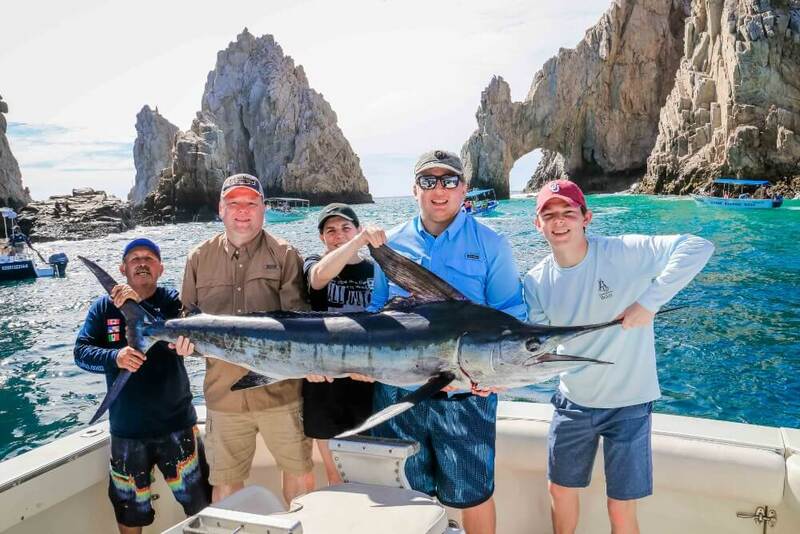 Cabo San Lucas is the unofficial “Marlin Capital of the World” and has gained an international reputation, as this is the haven for the World’s most sought after big game fish. Imagine landing a 1200 pound Monster Marlin! It’s a year ‘round sport with the fish active most of the year. Setting the stage, you are sleepy awake at 6 am as you head to the docks to board one of the many boats making up the Blue Sky fleet. Your coffee in hand, you, your shipmates, captain and crew, head over for bait and licenses. As you wait, the water laps at the boat impatiently, calling you out to sea. Striped Marlin can be found in the slightly colder months, with Blue and Black Marlin appearing as the waters get warmer. Deep water ahead, a few miles from the shore where multiple seamounts and banks are accessible for a full day of fishing. Your captain knows the prime the banks and ledges where the fish lurk below. 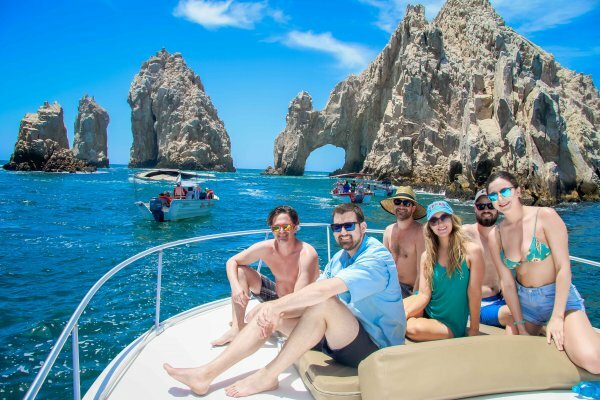 Well known “hot spots” are the Golden Gate Bank 15 miles North of the Marina, South of the Lighthouse 2-15 miles out, the Gordo Banks, 22 miles northeast of Cabo San Lucas on the Sea of Cortez side, and the famous Finger Bank, a Bill fishing paradise that is located 50 miles offshore. The majority of your catches are made using artificial high speed trolling lures or other tackle. Live bait is used primarily when the crew spots fish on the surface or when there are large schools of fish and multiple hook ups are in order. This happens primarily during strong Marlin or Dorado bites. Licensing in order, the boat rolls out of the Marina heading toward the fishing grounds. You might catch a glimpse of “Poncho”, our world-famous sea lion(s) who trolls the Marina for treats, scraps and even steals a few fish unexpectedly. If he’s not there as you leave, you can bet he will be there to greet you as you return with your bounty at the end of the day. As the sun starts to rise with spectacular colors, you move past the 2 mile protected area, heading towards deep blue. Its not unusual to travel at least an hour from shore before the lines are cast out. The captain and crew will be checking fish finders, listening to the radio for reports from other boats, setting GPS coordinates and looking for active fish, dolphins and birds that indicate the presence of schools of fish below. Trolling is the main way to catch Marlin, that is simply the boat pulling lines behind it with lures, live bait or teasers to attract fish. You may have multiple lines in the water at one time. As the crew scans the water for action, it’s a great time to check your pack, slather on some suntan lotion and take out the Polaroid sunglasses. The coffee’s long gone and most people hit their coolers for a cold libation about now. The lines scream from the drag on the reel when a fish is hooked. The crew will grab the pole and set the hook on the fish and hand you the pole. OMG! You have Marlin ! It may not be a 1200 pounder, but the fight it’s going to put up may take hours before it’s in the boat. 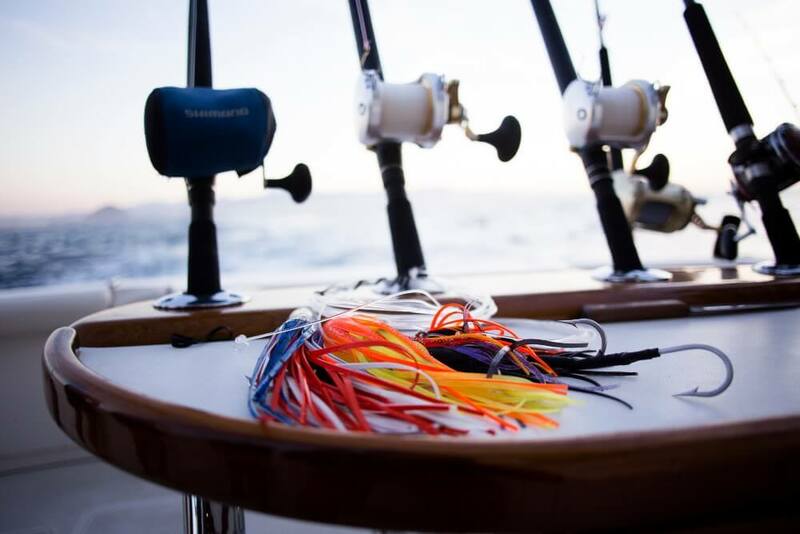 You take a seat in the fighting chair, you reel and pull and reel and pull – one on one with the fish. It rears up out of the water and you take in the beauty and magnificence of Mother Nature at her best. You yell for joy, you yell for the thrill, you yell for the hell of it as the Marlin dances at the end of your hook, mesmerizing everyone with the sheer beauty and power of it. At this point, landing it into the boat may become a community effort as the crew assists, your friends cheer you on, your arms and legs start to burn, but you stay the course. Landing a fish of this size is not easy. Enjoy the fight. Don’t lose the fish. As you and the fish tire, the crew will pull it to the side of the boat, on short line. It’s not easy to drag a fish weighing several hundred pounds into the boat, but eventually, it makes it way up and over. As the crew measures it up, you and your friends whoop, holler and take photos. Plenty of back slapping, beer toasting and congrats are going on. Someone just Facebooked a photo to the Internet. Your catch is now “official”. Catch-and-release is encouraged in Cabo San Lucas, and there is no limit to the amount of fish you may release back into the ocean. You can release a fish and have a replica made, the crew will measure the fish, take photos and inform the taxidermy company to meet the boat upon arrival. 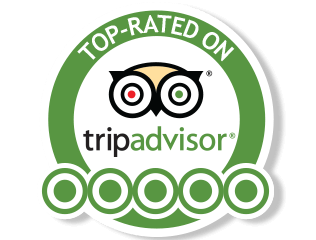 There are taxidermy shops in Cabo and the crew will also help before you get back, if you let them know that you are interested in mounting. A side note, mounting is not cheap and mounting big fish can cost thousands of dollars. You can also keep the fish. Griselda’s Smokehouse is popular for processing. Deep-sea fishermen may bring back only one Marlin and two Dorado, sailfish, tarpon, and halibut per boat. Overall, fishermen may bring back only ten fish total, and only five of a single species, per boat. Before you head in, the crew will have run their fish flags up the line, a way of bragging about your catches of the day. And of course, Poncho will be waiting for that unused bait as his toll for your re-entry into the Marina, as he swims right up onto the transom of your boat, mouth open and waiting. If your Marlin was a “keeper”, there will be more cheers from the marina crowd as your Marlin is hoisted up on the scales for more photos and bragging rights. Whether you catch and release or catch and keep, there is no greater thrill than hooking the mysterious, magnificent Marlin. It’s 6:30 am, dark, kinda cold as our party of six, hops in the car to head down to the Marina. Here we are, on our way to my first adventure in Deep Sea Fishing in Cabo San Lucas, Mexico. Actually, only one of us has ever been. The rest of us are “newbies” so to speak. We arrive at the dock to board one of the boats in the Blue Sky Fleet. Hoodies up, groggy, in need of hot coffee, we scan the Marina and find a local woman selling burros Great hand-warmers until they are eaten. But I still need that coffee. 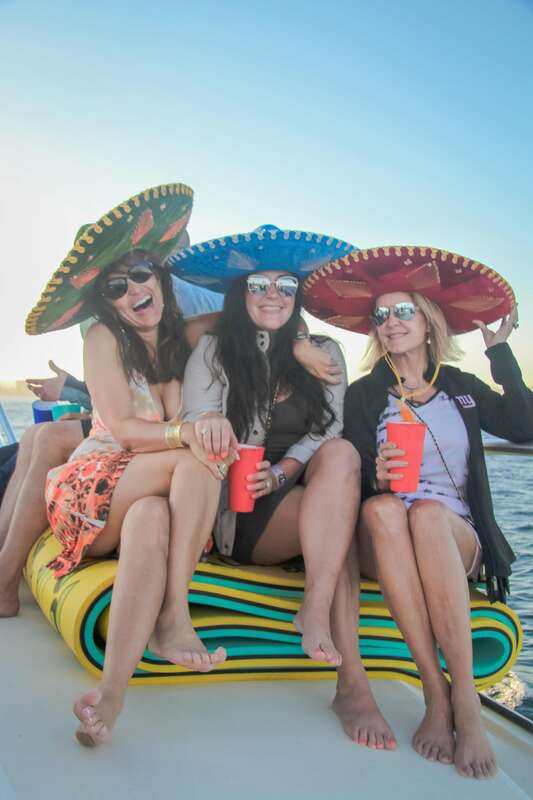 Our captain and crew meets us at the gate, and we’re outfitted for “bear” as the expression goes – fish in this case – meaning we have cold beer, tequila and sandwiches for later. A stop to get the licenses and we are on our way. We all nap a bit as we head out to sea, as the boat rocks us slowly into the motion of the ocean. Our group consists of me, my son, my niece and her husband, my nephew and my husband. We’re the mid-30’s to 60’s crowd. We pass the famous Arch and the boat speeds up once we pass the 2 mile protected, no fishing area. The brisk, fresh air and rising sun jolts us fully awake and we start taking notice of our surroundings. The Captain is heading out to the Pacific side. Open ocean ahead as the sky streaks vibrant blues and reds against the horizon. We hear the chatter on the radios as Captains exchange information of the day, all seeking that one big fish or the fish ball that harbors schools of fish, meaning there’s tuna and other fishes below. About an hour or so out, the crew start setting the trolling lines. We have 6 running at one time. Our family is a little more animated now, getting into the process of deep sea fishing. We chat with the crew, they embellish on the “fish ball” explanation, tell us to look for birds or dolphins. My niece hurls some “chum” over the side, needing to get her sea legs on. We laugh. She goes below and says “wake me up with the fish come”. We will certainly do that, we promise. The boat ventures farther out. It has turned into an amazing, sunny, warm morning. We lose the hoodies and enjoy the sunshine. We keep trolling, sometimes at low speed, sometimes at a good clip. The crew changes up the lures, keeping steady watch on the water. It’s been about 2 ½ hours now. No bites. We crack open another beer, dig into “lunch” and BS about who is going to catch the biggest fish and what kind it will be. I’m hoping for Dorado. The crew is fun, knowledgeable. I make them suffer through my Spanlish. They say, “we know English” as if to coach me back into an English-only conversation. We are having a great time. Relaxing, in search of fish, enjoying the company of ourselves and others. Suddenly, the radio squawks. There is all kinds of chatter between our Captain and others, as the boat turns broadly to the East and we head out, deeper to sea. 15 minutes later the crew and Captain are hollering, “ Look, look, dolphins”! My niece charges up from below. The dolphins are now swimming side by side with our boat. We see other boats in the distance, heading the same way. Suddenly I see the most amazing thing I have ever seen before in my life, dolphins jumping straight up and out of the water, to heights unthinkable. The crew yells out, “Fish Ball” as they change up the lures for Tuna. The ball is a school of tuna being herded by the dolphins as the dolphins swim through the ball, mouths intent on snagging a tuna on the way up. We see two, three, five dolphins at a time being airborne in a delicate ballet, holding their tuna prize for all to see. One line goes off ! The pole is handed to Christopher, my son. He takes the chair as everyone chants, “Reel” “Pull” and the line strains. He digs in and it takes about 5 minutes for him to land a “football” tuna, approximately 18-20 pounds. A second line hits and then a third. One nephew takes the chair as my other nephew straps on the harness so to stand up and bring in the next one. Then a fourth hits ! We have 3 active lines at one time! Hubby takes the 3rd line, also standing with a harness on. Those of us, without lines, cheer on the others, “Pull” “Reel” and one by one the “footballs” are tossed into the boat. The crew gets ready for the next bites. My niece, now fully awake, feeling better and very excited takes the chair as a tuna hits a line. She fights hard for 10 minutes and in comes the 5th flops onto the floor. Another line hits and the guys take turns standing, reeling, pulling and now we have a 6th and a 7th! The 8th tuna bites and I take the chair. Being short, I can’t get the leverage I need while sitting on the chair, but I reel and pull and reel and pull with all my strength. It seems like an hour but it was only minutes before mine pops over the edge. The dolphins are jumping and swimming, the tuna are biting, we still have three lines still going at one time and the crazy fun never stops. The crew is yelling directions to us, encouragement to us, slightly dazed I can hear the Captain radioing the other boats. Four other boats have now joined us. We are in tuna fishing Heaven. And then, it ends as quickly as it began. First Mate tells us we have reached our maximum limit. There we are with thirteen, football-size tuna. Exhausted, happy, congratulating each other. Memorializing ourselves via cell phone photos. Smiling crew members standing next to each of us with a bloody tuna in hand for the perfect photo op. The dolphins chattering good-bye as the boat turns to make our way back. We toast each other with a cold beer. Second mate asks if we’d like sashimi. He makes it on the spot and we savor our delicious raw catch. We are high speed toward the Marina. The Captain radios in that we have fish to be cleaned. The Marina looks closer than it is and in about an hour we reach the docks. Our fish flags are up, boasting to other boats and those on the Marina as to our successful catch. The ever famous sea lion, Poncho, makes his appearance and begs for our remaining live bait. We oblige. We leave three fish with the boat. A thank you meal to the Captain and his crew and tip them well for a great day. Someone magically shows up with a wheel barrow and loads up the tuna. We’re told it will take about an hour or so for processing. We find our favorite watering hole on the Marina. Relate our day to the bartender, who has probably heard all the fish stories she cares to hear in her lifetime. We buy shots, we drink shots, we buy a round for the house, feeling generous as the Sea has been generous and has shared its bounty with us. A day very well spent with the Captain and Crew of the Blue Sky fleet. Not all Cabo fishing charters are the same. 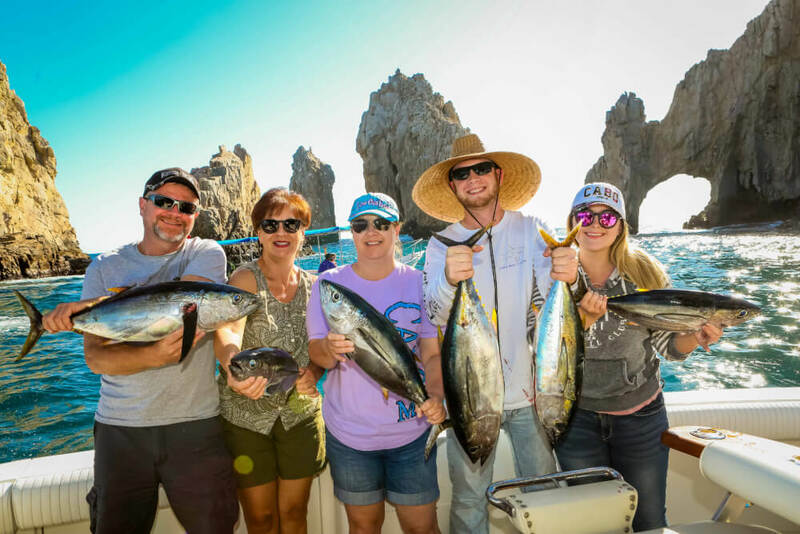 When comparing Cabo fishing charters, you need to be aware that some fishing charters offer full service, including bait, licenses and even the possibility of food and drinks. However most Cabo fishing charters offered are “bare bones”. 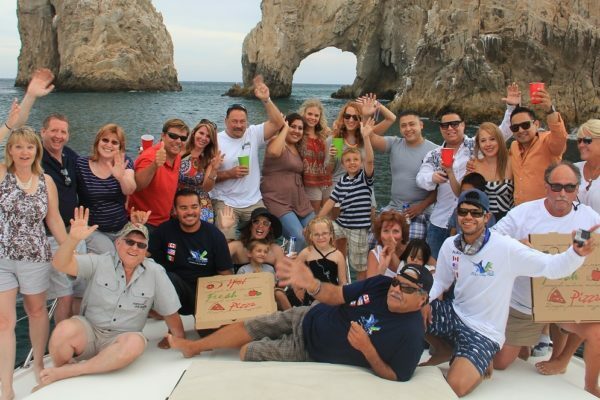 This means that your average Cabo fishing charters will include: Captain, crew, boat and gas. 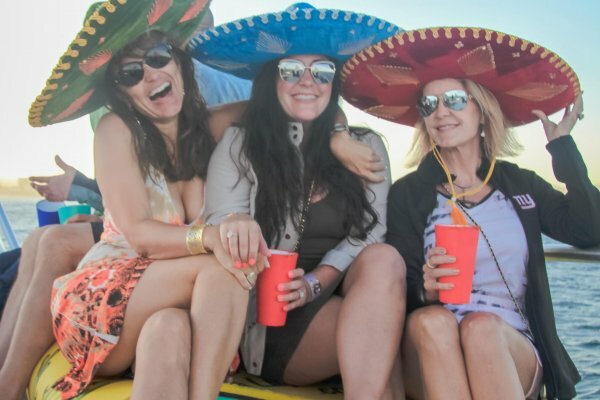 Your Cabo fishing charters typically do not include the costs of bait, your fishing license for Cabo, and you will need to bring your own food and beverages. 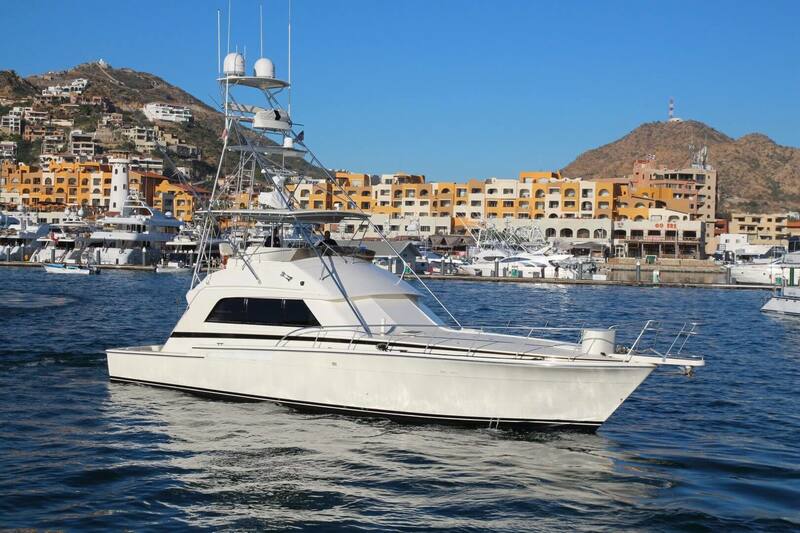 The Blue Sky Cabo fleet offers both options on their Cabo fishing charters. When booking your Cabo fishing charters, you need to ask what is included. 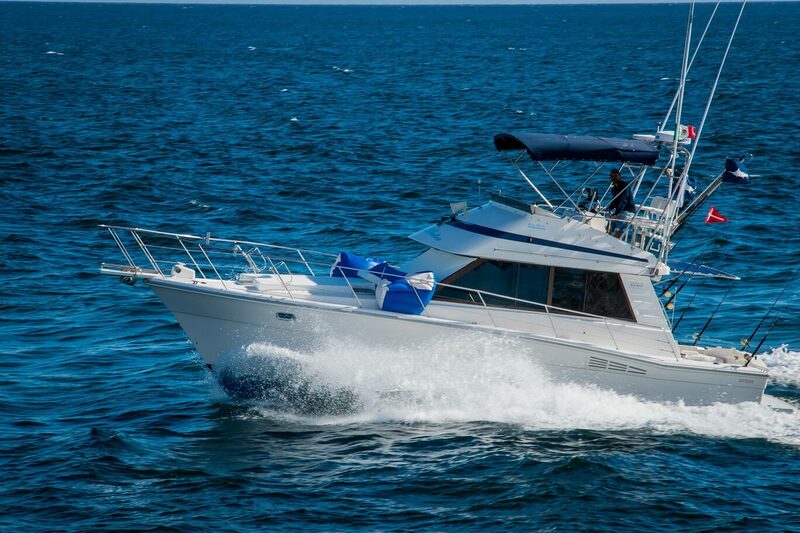 Price comparison alone, is not the way to decide which Cabo fishing charters are the best ones. 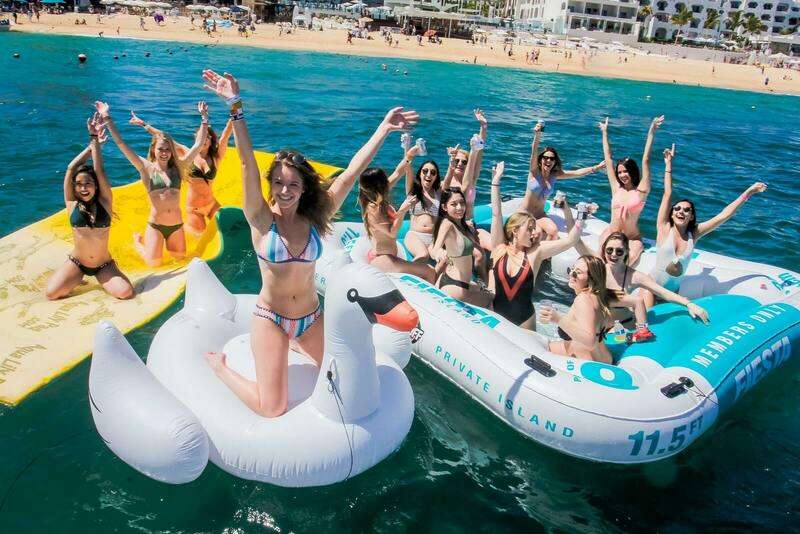 An all-inclusive boat should be chartered at least several days in advance in order to ensure that the chartering company has time to obtain your information for licenses and has given you the food and drink options available on their charter. 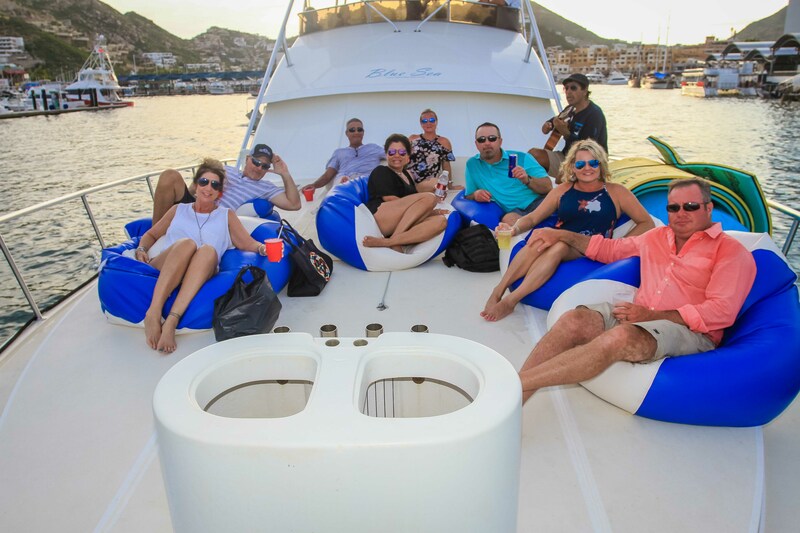 All-inclusive Cabo fishing charters are typically booked for a full day of fishing, since you want to enjoy the day being catered to your every need, right down to someone serving you a cold beer. ”Bare-Bones” Cabo fishing charters will assist you the day of your charter to obtain your license and they have the connections to the live bait vendor and will make a stop for bait. Typically you can find food to take on the boat right at the Marina in early morning. Be it home-made burritos, sold by locals or a sandwich purchased at one of the many restaurants on the Marina. You can also purchase beer, soft drinks and ice. So, don’t forget to bring your own cooler for your food and drinks. 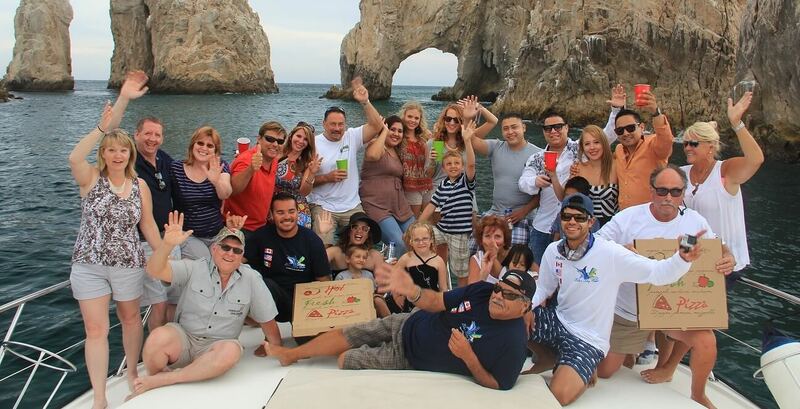 Most “Bare-Bones” Cabo fishing charters offer full or half-day fishing charters. Make sure you discuss with your group, which option is best for you. Although the cost of the half-day is less, consider that most Cabo fishing charters troll when deep sea fishing. It can take several hours to find the perfect spot where the fish are biting. 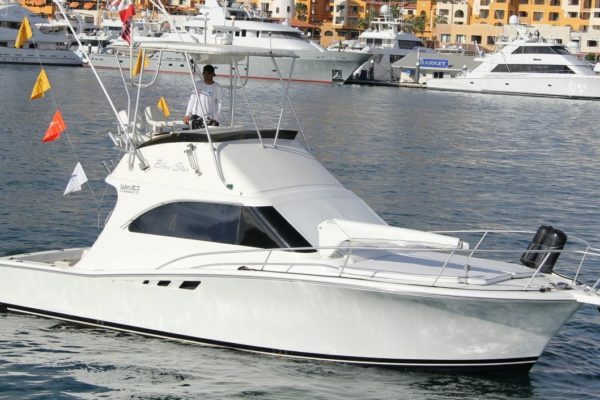 There are also booking companies that have many boats and fleets on their list of Cabo fishing charters. This way of finding a charter may give you access to view many boats available. 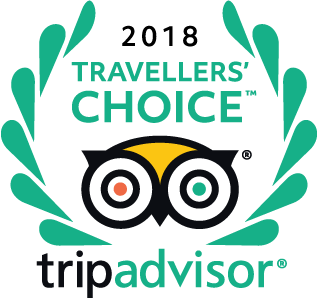 However, be aware that those Cabo fishing charters may be available directly from the Fleet Company at a better price than buying from a third party that does not have direct knowledge of the Cabo fishing charters operations. 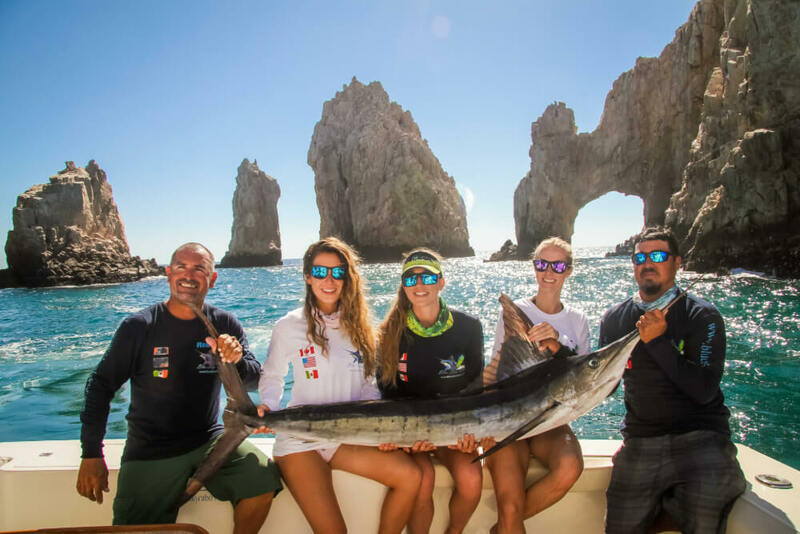 Trolling is by far the most popular type of fishing in Cabo San Lucas, with most Cabo fishing charters use a combination of live bait, artificial lures, and teasers. Trolling typically is used for tuna, marlin, dorado and other types of sports fish. Bottom fishing is also an option when targeting Snappers and Groupers. Bottom fishing refers to the most common way of fishing techniques, used to catch fish that are found near the sea floor. This technique requires the utmost drifting and anchoring tactics. Large predatory fish like the Grouper, Halibut and the Red snapper are found near the reefs, buoys and wrecks. And the best way to reel in one of them is using the bottom fishing method. Bottom fishing can be done from a boat using either hand lines or rods. The main aim of this technique is to take the bait to the bottom of the sea and present it in a tempting way to the fish and to lure them into the hook, very much the same as fresh water fishing. The Red Snapper is a very popular fish among the bottom fishing anglers for its fierce ways. Red Snappers fight hard so catching this fish is taken up as a challenge by many sport fishermen. A lot of time Deep Sea fishing: Marlin, Tuna and Dorado are caught off shore – sometimes 15 miles or more out to Sea. Bottom fishing is typically done close to shore… Fishing for Snapper, Pargo, Trigger fish, Grouper, Flounder, etc does not typically involve trolling. Instead, you stay in one area and fish off the bottom. Your Cabo fishing charters Captain and crew will know what fish are running when you book your charter. You should discuss with your group as to what kind of experience you want. Deep Sea fishing vs Bottom fishing. 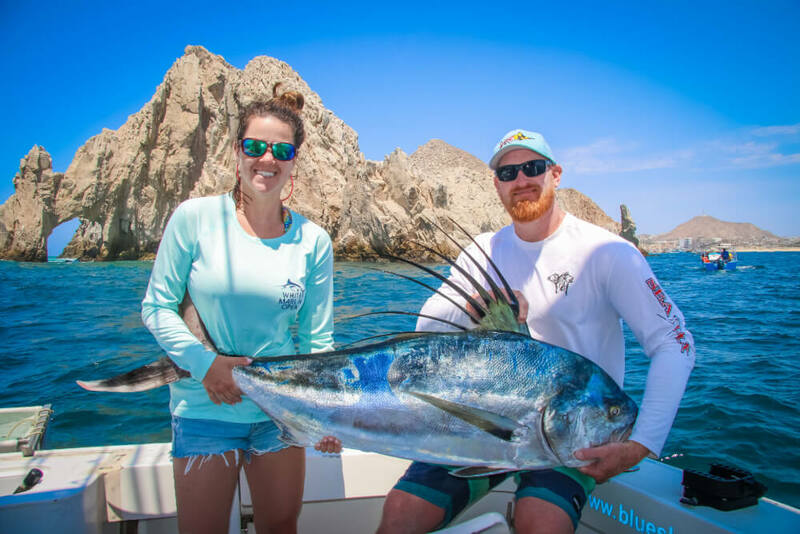 You may want to split a full day of your Cabo fishing charters between both styles. Remember, both methods take time and patience as you are in search of the fish, they are not in search of you!